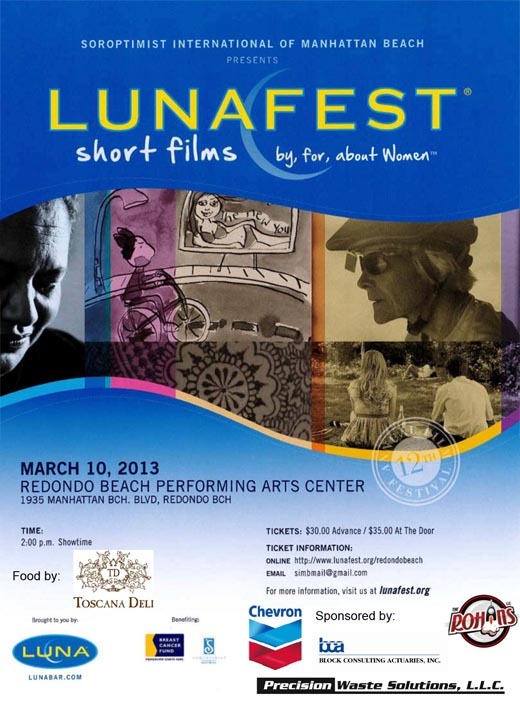 "Soroptimist International of Manhattan Beach (SIMB) is proud to present LUNAFEST short films by, for, and about women at the Redondo Beach Performing Arts Center. We hope that you will join us for a delightful Sunday afternoon of snacks, wine and fabulous short films. You will not be disappointed by this year’s selection of short films. 15% of the net proceeds will benefit the Breast Cancer Fund which “exposes and eliminates the environmental causes of breast cancer”. The rest of the proceeds will go to SIMB in order to help fund our various projects. These projects include but are not limited to: Breast Cancer Comfort Bags, the Women’s Opportunity Award (http://www.soroptimist.org/awards/awards.html), the Ruby Award, the Violet Richardson Award (http://www.soroptimist.org/members/program/Program_Violetrichardson.html), scholarships to high school students, supporting local organizations that help women and/or girls, and Soroptimist STOP Trafficking. Soroptimist International of Manhattan Beach is a local club of the greater Soroptimist International service organization whose mission is to improve the lives of women and girls in our local communities and throughout the world. Soroptimist is a coined Latin word meaning “Best for Women”. If you are interested in learning more about Soroptimist please visit our website listed below.